Imagine you are young and impressionable, and in love with a rock and roll band. Not just any old band either, but the Greatest Rock And Roll Band In The World™. Imagine that you create a fanzine in your bedroom in your parents house, and actually manage to get a copy to the band. Then imagine they think you seem like a good enough guy and invite you into their inner circle. They make your zine the band’s official newsletter, sent to thousands of fans around the world. You get to follow them around the world. It’s the days before blogging, so in between adventures you have to lay out and publish and distribute these stories, photos, and interviews. And all the while, the band is falling apart at the scenes. Bill German lived that. I saw him speak last night, promoting his memoir Under Their Thumb. If you’re a Stones fan at all, do yourself a favor and try make it to one of his appearances. If you’re not, go out and buy Exile On Main Street and a bottle of bourbon and listen for a week. 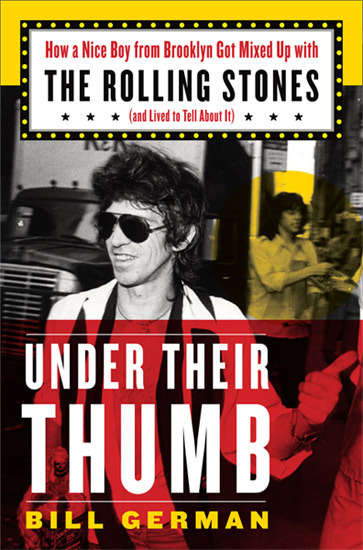 The time period covered by this book is the late 70’s to the early 90’s Stones bios that touch on this period at all tend to focus on the Mick vs. Keef war that went on for most of the 80’s. But there’s a whole story to tell beyond the sniping in the press. It really is an overlooked time period, and Bill comes at it from a very unique perspective. He was an engaging speaker overflowing with stories. I’m greatly looking forward to reading this book. Categories: Uncategorized Tags: Keef, Keith Richards, Mick Jagger, Rolling Stones, Ron Wood, Under Their Thumbs.